In central Washington, Lake Roosevelt National Recreation Area (NRA) provides water recreation, camping and history. The lake was created from the Grand Coulee Dam along the Columbia River in the 1940s, encompassing a 130 mile long recreation area administered by the NPS. While visiting I picked up their Junior Ranger newspaper. If seven or younger three activies are to be completed, if older then all six activities are to be completed. In addition everyone is to attend one ranger-guided activity (if available) and hike one of the trails described. The program is Senior Friendly with no upper age limit given. The activities include; Messages in Stone, The Artifact Jungle, Fort Colville Word Scramble, Fort Spokane Indian Boarding School Word Search, Fort Spokane Military Mega-Mazes, and What About the Future? 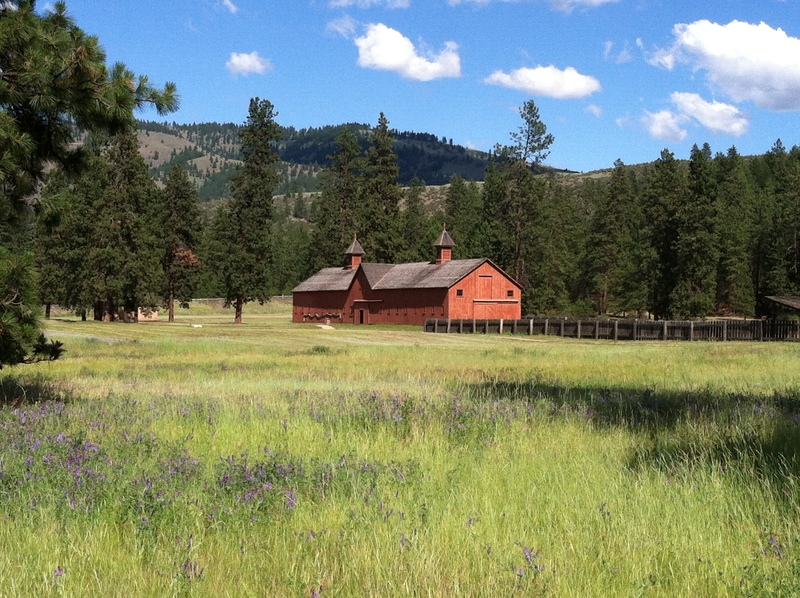 Three trails described are scattered throughout the park site; Mission Point Trail near Kettle Falls Campground, Sentinel Trail at Fort Spokane and Bunchgrass Prairie Nature Trail at Spring Canyon Campground. While completing any of the hikes, a Junior Ranger Notebook has you record plants, animals, habitat and other details seen and heard along the hike. While visiting I camped at both Spring Canyon and Kettle FallsCampground. It was very hot, reaching over 100 degrees during the daytime, but cooled off nicely at night. At Spring Canyon some of the sites have covered awnings to block the sun and groomed, green grass. It was too hot to hike the nearby nature trail. On our way north we stopped at Fort Spokane, a historic site which was also used as a school in the early 1900s. The grounds have an interesting self-guided walk to explore the historic buildings. Our final stop was at Kettle Falls Campground, right along a narrower section of the Columbia River, as it heads south from Canada. It had been very hot all day, I was glad when the evening cooled off for comfortable sleeping. In the cooler morning I enjoyed hiking along the river. A few flowers, mainly Sego Lillies, were in bloom along the trail, which I noted in the Junior Ranger Notebook section. As I traveled around the NRA I completed the six different activities, all provided interesting information. The Artifact Jumble was my favorite, as it helped to show the long history of many different people who inhabited the upper Columbia River. In my drawing for What About the Future? I drew a free-flowing river, wishful thinking, but my hope for the future in 100 years. In the Kettle Falls area there were no visitor services staffed by park rangers so I mailed the completed paper to the address indicated on the back section. In the return mail I received the ranger-signed Junior Ranger paper, an attractive patch and a geology-specific booklet, which nicely explains the unique geology of the area. This is a lesser known park site, but one that has more than just a lake to visit, it has a rich human and geologic history, well worth the time to visit and explore.